You’re about to learn some useful phrasal verbs with ‘be.’ Also check out 5 Surprisingly Common Phrasal Verbs That Most Learners Don’t Know. 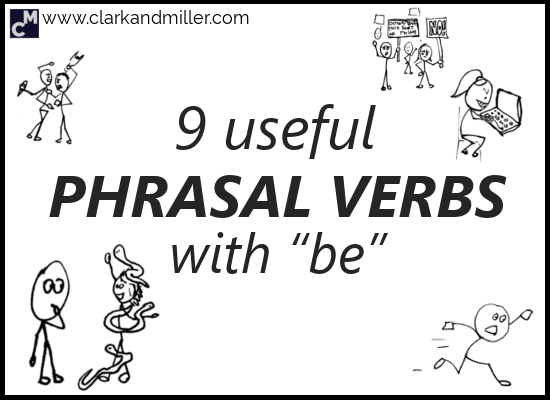 Some of the most common phrasal verbs in English are phrasal verbs with “be.” You’ll hear these everywhere — especially in informal English. So you’re sitting down with some friends at their house watching TV and having a bit of a chat. Then you check the time and realise you need to get back home — you’ve got an early start in the morning. And it’s definitely better than just standing up and leaving without saying anything. And remember that this is pretty informal — so be careful who you use it with. If we say someone is up to something, it usually means that we think they’re doing something dodgy — something suspicious. We shouldn’t trust them. We can also say “She’s up to no good. I don’t know what it is, but I know it’s not good.” Think about how you feel when you see a group of 10-year-old boys hanging out together by the empty building on your street. I want to be part of this plan. Please include me! We often just use the phrase “I’m in!” to show that we’d like to be included. We also have the phrase “count me in,” which means the same thing but shows just a little more enthusiasm. Yep — you got it! It means you don’t want to participate in something anymore. Once you’re “in” — once you’ve agreed to do something — you don’t absolutely have to stick to it. Sometimes you just have to change your mind. This can mean that she’s chasing you. Or it can mean that she’s looking for you because she wants you to do something for her. That’s how they talk in America according to television. We can also be after something instead of someone. If you’re into something, it means that you like it. You like it a lot. And you probably know a lot about it. Most people are really into something. Me? Well, I’m really into language and music. I listen to loads of different kinds of music, and I know a lot about music. And language. Some people are really into gardening. Or yoga. Some people are really into their jobs. Sometimes that can be good, and sometimes it can lead to burnout. I never believe anyone who says they’re not into Star Wars. It means she’s very enthusiastic about something. You’re doing something wrong — or at least you’re hiding something. But they know! THEY KNOW! They might not know exactly what you’re doing, but they know you’re doing … something. And they’re going to figure it out! OK — so let’s go for a Hollywood-style example and a real-life example. I’m for it. / I’m against it. “For” means you support something. “Against” means you oppose it. Notice that we can say “dead against” if we’re strongly opposed. Also notice that we can say “all for” if we strongly support it. Good work — now you can use phrasal verbs with “be” to talk about what you like, where you’re going and whether the FBI have found you yet. Are you for or against banning cars in the city centre? I am all about these kind of articles. Now I am out until you publish the next article. Hello Gabriel, I really like your lessons. Although I speak pretty good English I always find something new and useful for myself. So, I am all for it! I’m sorry to say that I’m not into Star Wars but I’m like you all about music and language. Sad news about Star Wars! But glad to hear you’re into music and language — two of my favourite things (as well as British sitcoms). Do you play an instrument? What kind of music do you enjoy?